Hearst Corporation: News Corp acquired Hearst Corporation’s Skiff Reader in June 2010. Terms of the deal were not disclosed. But, if the unforgiving environment for new readers is any indication, Rupert Murdoch acquired it for a throwaway price. Apparently, News Corp was interested only in the software platform that runs the device. Foxit: Their reader, eSlick, was considered among the best due to its excellent pdf support. But last month, the company announced plans of ceasing development of the hardware and offering the software for other digital book providers. Interead: A small start-up from UK made an emphatic splash at the 2009 Book Expo America when it announced its reader COOL-ER. But by July 2010, it went bankrupt. Plastic Logic: This Company is pioneering the use of plastic substrate instead of silicon. Their premium reader the QUE proReader announced with big fanfare at CES was targeted towards business users. But, in August, Plastic Logic announced the Que as no longer commercially viable. iRex Technologies: Netherlands based iRex delayed their Digital Reader 800 launch for not getting FCC approval on time. The original plan was to release it in time for the holiday shopping season. But in June, the company filed for Chapter 11. Polymer Vision: The Company enjoyed a good following with its distinct bendable e-paper display, but ran out of capital before the projected launch date of the reader Readius. The company warned about funds being too low for the launch to go through in April and filed for bankruptcy protection in July. Entourage eDGe E-Book Reader 3/12/2010 $499 Distinct look with a dual-screen (9.7” e-ink and 10.1” LCD) display, WiFi enabled, and comes with a virtual keyboard. Kogan eBook Reader 08/27/2010 AU$189 (About US $170) Marketed as a reader made in Australia for native use, it uses the open EPUB format along with a number of other formats. It does not have WiFi or 3G. Kobo eReader by Kobo Inc 06/17/2010 $129 A Borders book-store backed reader from Australia with features similar to the Kogan. The original pricing of $149 made it cheaper than the Kindle but the Kindle 3 WiFi release at $139 had them scrambling and eventually reducing the price to the current $129. Borders also has an alternative smaller (5” screen) reader from Aluratek at $99. Alex eReader by Spring Designs 04/14/2010 $399 The winner of Best of CES 2010 eReader category, it is a dual-screen Android driven device allowing it to run Android applications. The dual functionality puts it closer to the Apple iPad than Amazon’s Kindle. Pi by Infibeam.com 02/24/2010 Rs 9999 (~$220) A standard 6” player from India with WiFi, 512MB storage, an SD card slot, and multiple language support. The store has over 1,00,000 titles currently available. It can also double as music player and a rudimentary games console. Wink by EC Media 08/19/2010 Rs 11490 (~$250) Another 6” player from India with 2GB storage, and SD card slot, and multiple language support. Has a tie-up with DC Books and the store has over 2,00,000 titles. Gorld 600TW 03/15/2010 2880 Yuan (~$420) A full-featured 6” combination player from China with a cellphone, WiFi, GSM GPRS, and blue-tooth. * HP Slate, Samsung E6 Slider, and Samsung E61 did not make this list, as they are not yet generally available. Txtr by Wizpac, the eReader from Germany, also is not listed above for; it is only available on pre-order (299 Euros) without a set delivery date. Amazon Kindle Wi-Fi 08/25/2010 $139 3rd generation 6” reader. No 3G, but pricing makes it an unbeatable deal. Amazon Kindle Wi-Fi 3G 08/25/2010 $189 Pricing again makes this an outstanding deal, with 3G functionality! Amazon Kindle DX 08/25/2010 $379 Premium 9.7” reader with WiFi and 3G. Barnes & Noble Nook 06/21/2010 $149 WiFi only economical alternative of the original Nook priced $40 lower. 185 pounds in the UK (~$250) Korean reader with some unique features and very good build quality but pricing is too high. Cybook Opus by Bookeen 05/07/2010 $199.99 Smaller 5” screen with 1GB storage and Micro SD card option. Elonex eBook 01/04/2010 129 pounds in the UK Smaller 5” screen with SD card and preloaded with 100 classics. Built-in Adobe Reader Mobile. * Sony Reader Pocket, Touch, and Daily Editions along with the Hanlin & Hanvon eReaders from China are not listed above, as their 2010 versions are not generally available yet. One big decision point when choosing amongst these is epub support: Amazon’s eBook format is proprietary. The rest of the competition supports epub (click to see the huge almost free epub selections). Also, Amazon announced a library lending feature for Kindle on 04/20/2011 which further differentiated Kindle from its competitors. If you are OK with being tied to Amazon’s proprietary file format, then choose the Kindle – the hardware pricing & ebook selections on the Kindle are hard to beat. Otherwise, one of the others would suffice. Sony's is a stand-out product, but is quite expensive. Best Values in eReaders - A Comparative Review (this post). Kindle eReaders - A Comparative Review. Kindle 2 eBook Reader - Is it Bleeding Edge? - A Frugal Take. Amazon is yet to develop a “Used Book” pricing/selling model for eBooks. Pricing is not palatable. To enchant the masses, a better model would be the tried and true approach adopted by game console manufacturers of giving the hardware away at below-cost while making it up in title sales. Title pricing is overkill, especially since there is no used book market. Lending is not a Kindle virtue – not even to other Kindle owners. Kindle’s wireless purchase/download interface (Whispernet) is restricted to within the US. Even within the US, coverage over Sprint’s network is limited. Once the connection is in place, the Internet access over the network comes free, courtesy of Amazon’s deal with the carrier. Kindle’s ergonomics are below par. Although lightweight at just over 10 ounce it is still heavy to clutch for extended periods of time, especially with one hand. In fact, given the placement of buttons single-handed operation is impossible. Kindle’s e-ink screen, while a big improvement over LCD screens, doesn’t compare well to printed text on real paper. Akin to real books, the absence of back-lighting makes Kindle unsuitable for night reading – ideally, non-intrusive lighting which can illuminate the text and the background in a graded manner is required. Kindle lacks any support for the visually impaired. Amazon lowered the lofty launch pricing of Kindle2 in three tiers. From the February 2009 price of $359 – the pricing went down to $299 in July, to $259 in October, and to $189 in June of 2010. A premium version called Kindle DX was unveiled in June 2009 for $489. A larger screen size (9” vs 6”), accelerometer (auto-rotate pages between landscape and portrait display by turning the device), and native support for PDF files set it apart from the Kindle 2. In October 2009, an international version of Kindle 2 replaced the US domestic version with added standard GSM and 3G supports, thereby allowing the use of the Whispernet interface in over hundred supported countries. Pricing was a slight premium at $259. In June 2010, the price decreased to the original Kindle 2 exit pricing of $189. In January 2010, an international version of the Kindle DX was released. As with the international version of Kindle 2, the Kindle DX also ships in over 100 countries. Amazon introduced a new generation of Kindles’ (nicknamed “Kindle 3” by the media ) in July 2010 - shipping began in late August. Amazon subdued the critics on pricing with this release, by offering a toned down version called Kindle Wi-Fi (no 3G support) for $139. For $50 more, a version with 3G is available and it replaces the Kindle 2 International Edition. A premium version called the Kindle DX Graphite priced at $379 replaces the Kindle DX International. Supported File Formats Kindle (AZW), TXT, PDF, Audible (Audible Enhanced (AA, AAX)), MP3, unprotected MOBI, PRC natively; HTML, DOC, JPEG, GIF, PNG, BMP through conversion. Kindle (AZW), TXT, PDF, Audible (Audible Enhanced (AA, AAX)), MP3, unprotected MOBI, PRC natively; HTML, DOC, JPEG, GIF, PNG, BMP through conversion. Kindle (AZW), TXT, PDF, Audible (Audible Enhanced (AA, AAX)), MP3, unprotected MOBI, PRC natively; HTML, DOC, JPEG, GIF, PNG, BMP through conversion. Through the different iterations in the last eighteen months, Amazon has successfully altered Kindle from a niche product to one with mass-market appeal. The path was bumpy with several missteps, but Amazon to its credit attended to nearly all of these concerns in a satisfactory manner. Terms of Service violation: This occurred when Amazon withdrew George Orwell’s Animal Farm and Nineteen Eighty-Four in July 2009 and then remotely deleted the files from the devices and provided a refund to the purchasers. A lawsuit requesting class-action status was settled in September of the same year with Amazon offering to restore the deleted files and altering the TOS to explicitly state that content once purchased will not be remotely deleted without user consent or request of refund. Abuse of Pricing Power: Jeff Bezos declared in 12/2009 that 65% of the revenue from eBook sales belongs to Amazon and the remainder split between the author and the publisher. The press was all uproar over this revenue sharing ratio – especially in the face of Apple’s App Store ratio of 70% to the publisher. Almost immediately, Amazon retracted offering to match publisher royalty at the App Store, subject to the publisher agreeing to certain conditions. Download Charges: Absence of additional charges to download purchased content over Amazon’s Whispernet and Whispersync facilities is a key selling point of Kindle. However, this applied only for US customers using Whispernet within the US – elsewhere a fee of $1.99 applied. This fee has since been reneged. Also, there is an email-based mechanism to convert documents to Amazon’s proprietary DRM-restricted format (AZW). To get the converted files directly to the Kindle, Amazon charged a fee of $0.15 per MB. The free alternative provided by Amazon is to get the converted files via email and then upload it to the device via USB or Wi-Fi. Accelerating the availability of Titles. While it is understandable that, negotiating with publishers to arrive at a market viable deal is a monumental task in itself, it is not a justification for disregarding these features. The only respite is that the competition is even further behind in almost all of these aspects, though some like B&N’s Nook allow lending of books for short duration. Overall, we recommend the purchase of the Kindle . Pricing has settled well, title availability is improving, and the odds of Amazon releasing in the near future, a vastly improved version, consequently causing buyer remorse has diminished. Kindle WiFi is the Best Value , unless extensive travel is involved. If so, the better option is the Kindle WiFi+3G version for $50 more . With the product maturing fast, it is highly likely that Amazon will decelerate the pace of new versions and/or feature-sets in future releases. Further, most of the features that Kindle currently lacks can be incorporated without being tied to a particular hardware version. Hence, it is probable that such features will get released with backward compatibility built-in. Best Values in eReaders - A Comparative Review. Kindle eReaders - A Comparative Review (this post). 1. Windows and Sliding Doors – Double-pane windows became a household name in the residential space only in the late 80s. 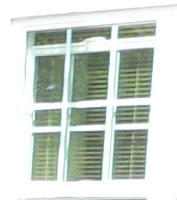 Our house constructed in that era had double pane windows only for the living room. Acrylic frames made their debut much later. Today’s acrylic double pane windows and doors provide better noise protection, energy savings, and improved looks. The windows, sliding doors, kitchen bay window, and the exterior painting/maintenance were done together as a package. The windows averaged $250 while the sliding doors and kitchen bay window were in the $1800 vicinity. Contemporary colors were chosen for exterior painting. The return on this investment on this home improvement project was immediate - it gave the house a much-needed face lift. When upgrading windows and sliding doors, contractors promote the option to replace the seating for the frames as well. This involves additional labor and certain counties require construction permits. Only very old places encounter the possibility of the seating getting completely rusted out. Unless that is the case our recommendation would be to bypass this option, as it would be harder to recoup the additional home improvement cost. 2. 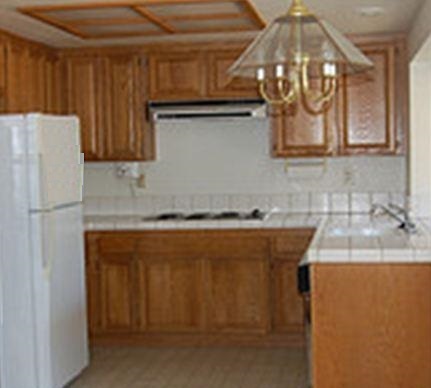 Kitchen – Kitchen remodeling is one area people tend to break the bank. The industry experts have largely blind-sided the public here by constantly hyping this as a proven home improvement area, where one cannot but recoup their investment with dividends. Doing the back-splash and the floor tiles in a diamond pattern for an illusion of volume. Lesser wall space meant lesser cabinets, which lent a slick finish. By not sending to landfill the existing cabinets, our storage needs were greatly met thereby keeping costs down. The one area we splurged on was on fancier back-splash tiles. 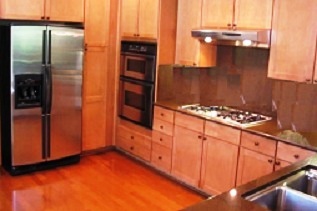 Research on kitchen remodeling will show similar kitchens costing upwards of $60K to modernize. 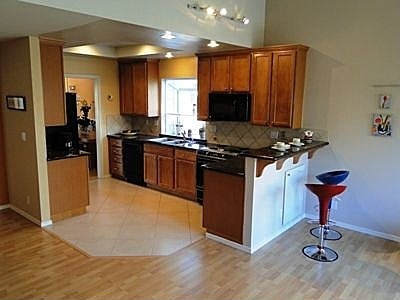 We were firmly committed to NOT expanding the square footage of the house to accommodate a bigger kitchen. That one decision saved us a lot, as expanding square footage inevitably comes with its huge baggage of labor, material, and permit related costs. Overall, we consider this home improvement a good value for money, unless you go overboard. 3. Floors – Being veterans of all flooring options – carpet, tile, stone, laminate, and wood, we strongly advocate something other than carpets. Carpets amass dust and other things underneath them over time rendering useless all kinds of cleaning including professional jobs. Periodical replacement is the only real solution. Stone and certain types of tile tend to be more expensive and they are not exactly feet friendly. Nonetheless once installed, they are a very low maintenance choice providing better protection from the elements (moisture, termite, etc.). Wood or the modern equivalent Engineered Wood is greatly preferred if budget allows, though moisture is not held at bay. Laminate is a good middle-ground alternative although not as durable as tiles or wood. Our house had the original standard carpeting for the most part (including bathrooms), while the entryway, the wet-bar area, and the kitchen had the standard half-inch tiles. The yellowed, spotted carpets paved the decision to replace the entire flooring as part of our home improvement project. We laid Pergo laminate flooring for most of house, black granite for entryways and other areas, and large (2”) tiles in diamond-pattern for the kitchens and bathrooms. Diamond pattern along with design work for the corners are both labor-intensive and consumes more tiles but greatly enhances the overall look as the pattern gives a larger feel to the space. When replacing tile floors choosing to lay them atop the existing tiles involves less labor and associated dust/cleanup. Baseboard skirting that attaches to the wall comes in a variety of shapes and forms with each type intended for a particular spot. It is easy to unknowingly use the wrong type. As laminate or wood flooring has to float on its backing there has to be a gap between the floor and the wall, wood frames, skirting, etc. Else wood expansions and contractions brought about by climatic changes can cause the floor to quickly warp. 4. Lighting – The norm for the majority of the houses in the US is to have no lighting in place for nearly all rooms except the bathrooms and the kitchen. The logic behind this approach is that it provides the owners an opportunity to furnish the place with chandeliers and other ornate lighting options of their choice. In fact the lamp and shade industry has capitalized on this trend by pushing the wonderful mood setting effects of lamps. The downside is that such items take up space, collect dust and promote a heavy and dated look to the house. The contemporary approach is to go for recessed lighting with dimmer capabilities and use sleek fixtures when absolutely necessary. Our house was similar to the rest of the US with some patched up lighting in one bedroom and the wet-bar area. We went for the most economical standard 5” recessed lighting wherever possible and employed track lights and fixtures on other parts keeping the costs for this home improvement project below $5K. The possibilities to top this figure are endless as home improvement options abound for recessed lighting with increasing cost. This is one area where it is vital to use an electrical contractor as opposed to a general contractor who claims to be the Jack-of-all-trades - it is easy to complicate the circuitry that can cost an arm and a leg later on. 5. Garage – Unless opting for a finished one with a new house, garages come with just the framework in place. The good news is that it is relatively easy to finish, insulate, add an attic if there is a high enough ceiling, etc. A garage is also the holdall for stuff so save for the ultra-efficient, clutter free folks, this is a required home improvement upgrade. We did all this and moved the original kitchen cabinets as well for a combined cost of around $2.5K including labor - overall, the best value for money, as far as home improvement projects go. Purchasing cabinetry to install in the garage can significantly add to the cost of this upgrade. It can also be taken one step further and have half of it transformed to an office with flooring also in place. 6. Painting – A fresh coat of paint breathes a new life to any house. It is very common to go with the single off-white color for the entire house. Also, if wood trims and/or cabinets are left untouched, simple takes on a new meaning for there will be little or no sanding involved. On our part, we opted to go color for both the walls and the built-in oak cabinetry – the oak cabinetry gave a vintage look to the whole house. Choosing colors were not straightforward for us and we turned to a professional color consultant (~$150/hr) after repeated trips to Home Depot and other paint shops – there are umpteen different shades of the same basic color, which can have different impact depending on the surroundings. Also, the different brands have products that differ in appearance (Regal Wall Satin vs Super Satin for example) and quality to further confuse the issue. The consultant’s recommendation had a total of almost twenty colors of Benjamin Moore paints (not to be confused with another brand Kelly Moore) although many appeared to be minor variations of each other. He also offered the services of his paint crew for between $6K and $8K. We opted to don the mantle of painters and have to say the results were more than satisfactory – it took us around a month to finish the house (2-3 hours average per day). The cabinetry was the hardest as it required sanding and used oil paint. The material costs added up to a little over $1K, making it a relatively economical home improvement option. Having to finance the improvement. When you choose upgrades from the builder, the cost gets added to the mortgage - this is a boon for many a cash strapped first time home buyer. Personnel inside the house for a prolonged period of time. Dust is a given and could be a deterrent for those with health problems. Renting while upgrading is a significant additional cost. Some options such as adding recessed lighting where crawl space is limited could prove prohibitively expensive after handover as significant labor is involved to work around the limitations. Even for peripheral items such as the garage, yard, and window furnishings involve hassles that can be bypassed by going with builder options. We became a first time home buyer when we purchased a new home in Alameda in 2003. It had about 30K worth of upgrades. We realized almost immediately our upgrades were conservative at best: we should have added recessed lighting throughout, upgraded the stairways and the upstairs carpet to name a few. Ultimately, we decided to largely live with what we got, except for doing the yard and window dressings. When the house was in the market in early 2004, a similar house with nary an upgrade was also listed – we were pleased when our house sold first at a significant premium over the other house, thereby justifying the value of the upgrades. Not everyone is on the quest for a brand new home and the condition of the houses generally reflects the market sentiment. 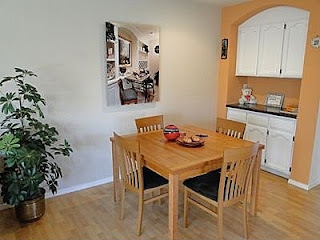 In a buyer’s market, the owners usually do a makeover for the listing to standout and attract the interest of the buyer. In a seller’s market, seller motivation is non-existent and the houses sorely reflect that. Even homes cited as “ready-to-move-in” might require significant time and effort before it becomes “livable”, as personal tastes are unique and can be all over the map. For the five years from September 2000 to September 2005, when home prices only knew the upward tick, the total appreciation of an average home in the Brentwood area recorded an astounding 125% while those in Alameda stood at a moderate but still handsome 65%. 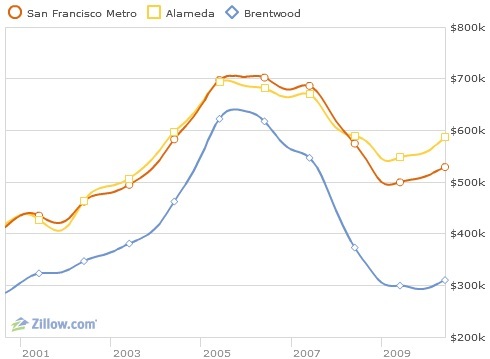 The trend took an about-turn during the 2005 to 2010 period when the bubble popped – average home price in the Brentwood area nose-dived to 50% while in Alameda took a more palatable 15% drop. As the average time of ownership of a home is around 5-6 years, it is worthwhile to mull over market conditions also than employing location as the sole criteria. Overall, for the 10-year period, the appreciation for an average home in Brentwood stood at just 8% while for Alameda it was closer to 40% - stressing location makes perfect sense when a home is purchased for the very long term. Timing: Conventional wisdom perceives low interest rates as the prime time for home ownership. Factually, this is counter-productive and favors only the minority that intends to hold the home forever. The average homeowner can profit more by going for home ownership when the interest rates have peaked and is on the downward trend . This notion is based on the economist’s pet supply vs. demand theory. When interest rates are low, housing is more affordable which translates to higher demand, which in turn pushes home prices higher. By the same token, when the rates march higher, properties become less affordable reducing demand and home values, thereby allowing a prospective homeowner to enter at a lower price. Buyers and Sellers Agents: While most residential real estate transactions involve both buyers and sellers agents, it is not uncommon to see listings bypassing an agent completely. The seller profits by not having to part with the agent’s commission, which is typically 5% of the money realized. The buyer’s assumption is that the costs would be lower sans an agent. The growing number of properties in the market availing of support systems (helpusell.com and other such businesses) in place of individual agents is a testimony to this perception. In our home ownership experience, going with a real-estate agent and specifically the best available wins handily, regardless of the market conditions. The only caveat is the type of agent – ideally, one should employ agents who specialize as either a buyer’s agent or a seller’s agent. In some markets, agents specializing this way are not an available option. If so, it is imperative to steer clear of the double-ending traps: when a popular agent has many listings and also many clients wanting to buy a house, it is inevitable that the agent will try to convince one of his clients into buying one of his own listings. More often than not, the parties involved are unaware of such connections, unless they specifically ask and/or read what they sign off. The downside with such deals is that the agent has a vested interest in double-ending the transaction. The best agents in an area often have a team of support services that can alleviate the potentially stressful aspects of buying/selling a home such as renting back and relocation.It is important to be aware that there are other agents who do such real estate related transaction tasks such as appraisal, home inspection, insurance, title, etc. Their involvement is relatively transparent to both the buyer and the seller, especially if you have opted for the services of a better real-estate agent.